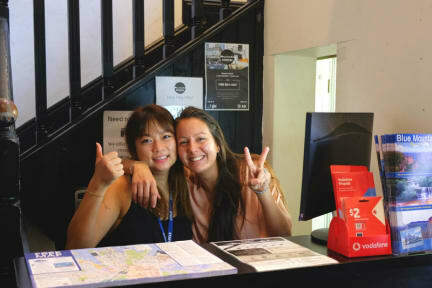 We are a small, chill, cheerful hostel located right in the city centre of Sydney! The best about our hostel? - Lockers in the rooms and corridors - get a padlock! Many things for you to be happy! Ah, and we rent bath towels and hairdryers. - Our hostel can be very quiet or very noisy, depending on the crowd! Welcome to The Downing Hostel family! All round great hostel, had the best stay. Will be back. The Downing is perfect! Room was great, excellent location, and staff were amazingggg. Great place to stay! It was my first hostel during my trip trough Australia and I really liked it. Staff members are really helpful and kind. The only con is the road. It is quite noisy during the night but I think that you have to take that for granted at a hostel. Another pro is that they have a meal offer in de bistro downstairs with a special price for people that stay at the hostel! Maybe I will stay for another night on my way back home. Nice hostel with very helpful staff. Excellent location and good amenities. Only downside is the social spaces are small and can get noisy outside rooms. Only positive thing about this hostel is the location. The WiFi does not work at all, the toilets and showers are never cleaned (or at least not well!) and the staff are not helpful at all. There’s no real atmosphere the staff keep to themselves in a little group and don’t try to involve anyone in activities. I would recommend staying somewhere else.